What is the best way to attach a small rock to a large stationary rock? This needs to be done underwater as I can't remove the large rock without taking apart all of the rock. I'm guessing some sort of epoxy works for this - but I have no experience with epoxy in the tank yet. Go to Home Depot and get some Aqua-Mend Epoxy and some superglue gel. You'll need to knead the epoxy until it is white. Probably a couple of pieces in several spots would be best. After kneading the epoxy, place some superglue gel on the epoxy and put that part into the rock that you will attach to the rock in the tank. Push it in good so it sticks in the little nooks and crannies of the rock. The put glue on the opposite side of the epoxy, which will be touching the other rock. While doing this, try and keep the epoxy in a ball shape so it can smash together/into the rock. Put the 2 rocks together and that should do it. I've never done this with rock, only with frags but this process does work better than superglue gel or epoxy alone. Awesome - I'll report back and let you know how it goes. Yup, Ereefic's superglue-epoxy-superglue method is what I'll use on problem frags. Also what I used to mount stuff onto my overflow [somehow they always come off the glass eventually, but stay on the overflow]. So, basically it goes - rock, superglue, epoxy, superglue, rock?? Mark, what kind of stuff do you attach to your overflow? 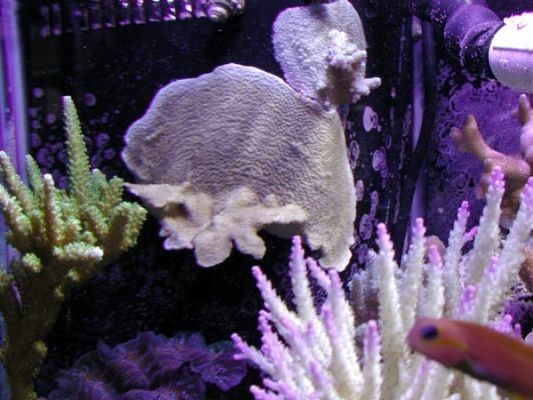 It's an old pic ... but I've attached a Monti cap and an Acropora onto the overflow. Well that was good timing! I was wondering what to do with the cap I picked up at the swap! Thanks for the suggestion Mark. Did I get the basic idea right on the glue/epoxy? Or, possibly finger, super glue, frag, super glue, finger, super glue, power compact fixture...etc, etc.